Darkest Hour - what does a rash of Winston Churchill portrayals tell us about Brexit Britain? Are our finest hours all behind us? What of the untold Churchill stories? And who can speak for Britain, today? Image: Darkest Hour promotional poster, Working Title. Reproduced under Fair Use. The Churchill industry can cover both strands, and for some his is the last uncontested great story of Britain. To others he is the last statesman who unreservedly represented the moral case for Britain; whereas for many on the left he has long been a problem figure. And whilst this is about our past and the dark days of 1940, is also about the storm clouds gathering today - from Brexit to the widespread cynicism in politicians and institutions. In the last year Churchill has been portrayed in the film of the same name by Brian Cox, the peacetime Churchill featured in Netflix’s ‘The Crown’, and most recently, played by Gary Oldman in ‘Darkest Hour’. 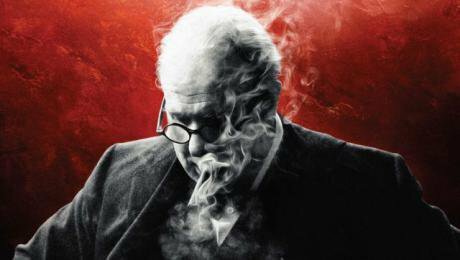 Oldman’s portrayal concentrates on that watershed period in the Second World War in May 1940 where the Chamberlain Government totters and then collapses, Churchill becomes Prime Minister, and the War Cabinet debates whether to continue the war effort or to seek out peace terms. This critical period has been covered in-depth by John Lukacs’ ‘Five Days in London, May 1940’ and more recently by Nicholas Shakespeare’s ‘Six Minutes in May: How Churchill unexpectedly became Prime Minister.’ ‘Darkest Hour’ opens with Labour leader Clement Attlee concluding the parliamentary debate that brought down Chamberlain as Prime Minister. It’s a brave opening for the film – the debate was known as the Norway debate, and its subject, the disastrous British campaign fought in Norway for which Churchill as First Lord of the Admiralty was largely responsible. This parliamentary occasion, lasting over two days in May 1940, was one of the great House of Commons moments. Speeches had consequences. Tory rebel Leo Amery – who in 1939 had famously criticised Chamberlain’s patriotism by asking Labour’s deputy leader Arthur Greenwood to “Speak for England” - concluded his intervention by urging Chamberlain (and invoking Cromwell), “In the name of god, go”. Chamberlain won the vote 281 to 200, but underneath the headline victory forty odd Tories had voted with Labour in the midst of war, and a greater number abstained. Despite all of this, Chamberlain attempted to stay in office and bring Labour into formal coalition (the period from September 1939 to this point having only a ‘National’ Tory-dominated administration). ‘Darkest Hour’ is good on the parliamentary machinations when Britain was under greatest threat. Cinematically the film showcases a kind of dark, claustrophic ‘House of Cards’. It illuminates the fundamental differences and personal tensions between Churchill, Chamberlain, and then Foreign Secretary Lord Halifax (widely seen and favoured as Chamberlain’s natural successor). Churchill became Prime Minister on 10 May 1940: the day Hitler invaded the Netherlands, Belgium, Luxembourg and France. In resulting discussions, Chamberlain and Halifax pushed hard for Britain to consider finding out what terms Hitler would consider as a basis for peace talks. Halifax is well portrayed in the film presenting what to many seemed sensible, saying Churchill’s florid rhetoric – “Words and words and only more words” - was all that he could offer. All three were acting from a desire to preserve Britain’s Empire and its global role. But where ‘Darkest Hour’ falls short, despite opening with Clement Attlee, is in failing to give proper space to the critical role of the Labour leadership and wider Labour Party over the course of May 1940. Clement Attlee opened the Norway debate for the opposition; it was Labour post-debate who forced a vote of no confidence which altered the course of British history. When Chamberlain faced the realities of his diminished stature following the parliamentary vote, he didn’t resign immediately. It was Labour’s attitude - that no coalition government was possible unless Chamberlain resigned - which forced him to go. It was Labour – specifically its Labour conference and its National Executive Committee (in a good story for Corbynistas) meeting in Bournemouth - which made the ultimate decision not to go into coalition with Chamberlain, but to support coalition under a new PM. Thus Labour played a pivotal role in not only bringing Chamberlain down, but aiding Churchill into Downing Street. Another area that ‘Darkest Hour’ badly fails is in its limited portrayal of the War Cabinet discussions on continuing the war. These were discussions in which the Labour members – Attlee and Greenwood – were central. In nine War Cabinet discussions over three days Chamberlain and Halifax made the case for finding out what Hitler’s peace terms might be, while Attlee and Greenwood stood with Churchill. Fascinatingly, at a time when Clement Attlee’s stock has never been higher, and when his patriotism has been celebrated in John Bew’s recent biography, this watershed moment for Britain, and Labour’s role in it, is often passed over. ‘Darkest Hour’ tells part of this story, but in a partisan way, only telling it from a Tory perspective. There are many untold Churchill stories, just as there are many finest hours. Amongst the untold Churchills there is that of the anti-Labour politician who ended up working closely in coalition with the Labour Party. Paul Mason observed that Churchill was a “flawed elitist” whose “genius in 1940 was not just that he understood the military situation, but dynamics of the British class system and what kept working class radicalism in check”. And then there is Churchill - the Dundee years, when he represented the city as Liberal MP from 1908-22 at a time when parliamentarians didn’t need to visit their constituency, let alone live there. His defeat in 1922 at the hands of Prohibitionist Edwin ‘Neddy’ Scrymgeour was one of the great radical stories of the city (one my parents told me with pride). T.E. Lawrence said of Churchill’s defeat, ‘What bloody shits the Dundeans must be’; Churchill himself felt that given the life ‘the Dundee folk have to live’, they had ‘many excuses.’ Personally, I would like to see this Churchill set to film although it probably never will. Churchill may be the most invoked Tory in history, but he represented much more than Toryism in 1940. Anthony Barnett coined the term ‘Churchillism’ to describe the national spirit which emerged in 1940,s distinct from the man. Churchillism was a national compact which brought together Tories, Liberals, Labour and other elites in a project which incorporated organised labour in return for economic and social rights such as the welfare state. But also evident was the passing of global leadership to the USA, the invention of the so-called ‘special relationship’ (a term coined by Churchill) and UK subservience to the national interests of the US. If it hadn’t been for 1940 and Hitler, history would not have been kind to Churchill. It would have regarded him as a reckless military adventurer (Gallipoli long staining his reputation), and an unreconstructed British imperialist out of touch in the 1930s even with most Tories, one who was intransigent on Gandhi and Indian home rule. As Britain’s attempts at renewal and modernisation have proven elusive, from the post-war settlement to Thatcherism and Blairism, popular folklore has returned again and again to the summer of 1940 and the appeal of Churchill. Similarly, it isn’t surprising that as Labour have experienced a chequered record in office since 1945, so the legend of Clement Attlee has grown steadily. The past as costume drama or fighting the ultimate forces of darkness which the Nazis provide, says something telling about Britain today. It points to a chronic failure of progress and absence of hope that the current state of abyss can be collectively changed. It says that the best days of Britain, days when there was purpose and clarity, are behind it, and that there are no current good stories. This obsession with the past is a diminishing one which damages the body politic now. That’s the frightening underlying message of these films relevant today. Who is there in our political classes who can talk about principles, show vision, and invoke an emotive rhetoric, which speaks beyond party and narrow calculation? At this time of crisis and doubt in Britain, there is no prominent leader who can – to paraphrase Leo Amery - speak for Britain. That is much more difficult in the fraught Brexit Britain of 2018 than the summer of 1940, and therein lies the contemporary problem and the yearning for an age where everything seemed much more certain.